Each year, American Portfolios looks forward to ushering in a new wave of promising, young entrepreneurs as it continues its support of educational organizations that promote business leadership. “Over the years, the firm has had the honor of hosting these competitions, as well as hosting VEI interns at our home office,” states AP CEO Lon T. Dolber. American Portfolios Financial Services, Inc. (AP), a privately-held, independent broker/dealer that services financial advisors across the country, hosted the finals for the eighth annual Long Island Virtual Enterprises International (VEI) Business Plan Competition on Feb. 26, 2019. VEI is a non-profit organization that offers in-school experiential learning programs for high school students to form entrepreneurial, start-up businesses within a live global simulated setting. Each year, AP looks forward to ushering in a new wave of promising, young entrepreneurs as it continues its support of educational organizations that promote business leadership. The firm has worked closely with VEI since 2014, and has nurtured a relationship that has proven to be mutually beneficial on many levels. Holding this competition at AP’s headquarters provides students with the backdrop of a true corporate experience. At the same time, the firm’s employees and investment professionals find the judging experience to be extremely rewarding. High school teams emerging as semi-finalists in the 2019 Long Island Trade Show held on Jan. 9, 2019, at LIU C.W. Post convened at the AP headquarters in Holbrook, N.Y., presenting their virtual business plans to a panel of judges. The 2019 VEI Business Plan Competition was comprised of 11 student-run business teams from 10 schools: Huntington High School (Team Poppy); Westhampton Beach High School (Team Sway); Carle Place High School (Team A Lil Twist); Patchogue-Medford High School (Team Nova); George W. Hewlett High School (Teams Comforting Canines and NAPR); Herricks High School (Team Infinity Bars); Syosset High School (Team AstroDough); Valley Stream High School (Team Strivana); The Berkeley Institute (Team Leisure in the Triangle); and Centereach High School (Team Rapid Brew). The finalists in in the Business Plan Competition were Teams AstroDough, Comforting Canines, Leisure in the Triangle, Nova and Poppy. The winning teams will advance to the VEI National Business Plan Competition, which will be held as part of the Youth Business Summit event on April 15-17, 2019, at the Brooklyn Cruise Terminal in Brooklyn, N.Y. The presentations were held and captured in AP’s in-house production facility, Studio 454, to provide students with playback coverage of their performances as a way to improve on their presentation skills for future VEI competitions. Throughout the event, students had the opportunity to meet and network with the firm’s senior management, investment professionals and staff members. Staging the competition at AP’s corporate offices helped students to associate how their virtual business management and operating procedural plans might apply in a real business environment. The firm looks forward to continuing its support of VEI throughout the year with internship and mentoring opportunities at its corporate offices, as well as nationwide throughout its 386 branch offices comprised of financial services business owners. Headquartered in Holbrook, N.Y., American Portfolios Financial Services, Inc. (APFS) is a full-service, independent broker/dealer and member firm of FINRA and SIPC, offering a complete range of financial services, including personal financial and retirement planning, securities trading, mutual funds, access to investment research, long-term care planning, insurance products and tax-free investing. Fee-based asset management is offered through its sister subsidiary, American Portfolios Advisors, Inc., (APA), an SEC Registered Investment Advisor. Both entities, along with technology entity American Portfolios Advisory Solutions, LLC, collectively reside under the legal entity American Portfolios Holdings, Inc. (APH). Full-service securities brokerage is available through a clearing firm relationship with Pershing, LLC, a BNY Mellon firm, the securities of which are held on a fully disclosed basis. The company currently serves 833 independent investment professionals located in 386 branch locations throughout the nation. It was named Broker-Dealer of the Year* (Division III) by Investment Advisor magazine in 2015, 2016, 2017 and 2018, as well as one of the top 10 Best Companies to Work for in the state of New York for 2016, 2017 and 2018 by the New York State Society for Human Resources Management (NYS-SHRM) and the Best Companies Group (BCG). Dr. Francine Federman, Assistant Dean, Farmingdale State College/Assistant Dean, College-High School Programs; Robert Valli, Dean, College of Management, LIU C.W. Post; Damon Joyner, Chief Financial Officer, American Portfolios Financial Services, Inc.; Kimberly A. Branch, CFP®, Vice President of Marketing Strategy, American Portfolios Financial Services, Inc.; Lisa DiBella, Vice President of Human Resources, American Portfolios Financial Services, Inc. 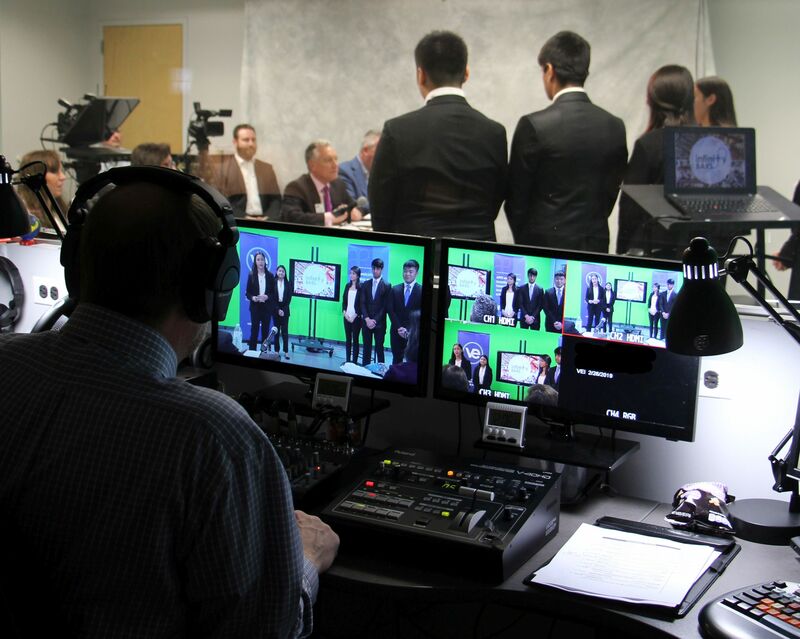 The presentations were held and captured in AP’s in-house production facility, Studio 454, to provide students with playback coverage of their performances.